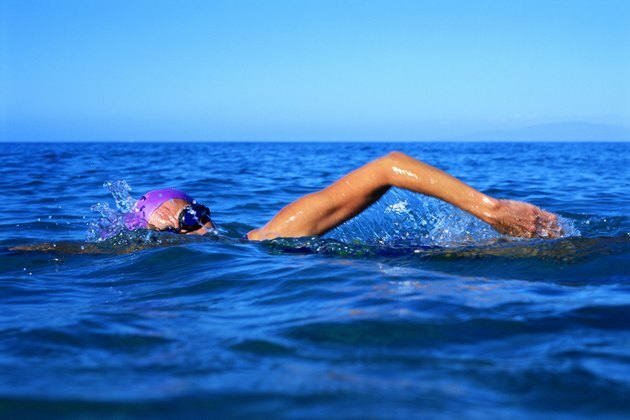 Swimming in the ocean can leave you invigorated and refreshed, but it also can leave you with itchy skin. A number of parasites and certain types of seaweed can be lurking about, waiting to bite, sting, infest or otherwise disrupt your day at the beach. Most causes of itching related to a dip in the ocean can be treated at home. Swimmer’s itch is an allergic reaction to microscopic parasites that can burrow into your skin. The parasites initially come from infected birds and other animals that pass the parasite eggs through their feces. When the eggs hatch, the larvae swim through the water searching for a particular type of snail that the larvae infect as they further develop into a type of larvae called cercariae. Cercariae leave the snails in search of their preferred animal hosts and will attempt to infect humans if they run across them in the water. Areas not covered by your swimsuit are most commonly affected. The cercariae do not live long in humans, but their brief stay provokes itchy skin, a burning or tingling feeling, and small red pimples or blisters. Sea bather’s eruption results in a rash, but this one typically hits areas covered by your bathing suit. Larval forms of thimble jellyfish and other particular anemones are to blame. The rash results from an allergic reaction to the poison that comes from the larvae’s stinging cells. The larvae can become trapped beneath your suit and the stinging mechanism triggered by outside pressure, such as your suit pressing against your body while swimming. The rash -- which often starts with a tingling sensation that transitions to itchiness -- can be accompanied by fatigue and fever. Seaweed dermatitis arises from exposure to a poisonous type of seaweed found in ocean waters throughout the world. This condition is sometimes confused with sea bather’s eruption because it also typically affects skin covered by your swimsuit. As your skin dries after getting out of the water, toxic chemicals from tiny bits of seaweed trapped in the fabric of your suit irritate your skin, triggering a itchy rash. Over-the-counter itch-soothing products and cool compresses or ice packs can help alleviate skin irritation after a swim in the ocean. The Centers for Disease Control and Prevention recommends over-the-counter corticosteroid cream and bathing in colloidal oatmeal, baking soda or epsom salts for swimmer's itch. For sea bather’s eruption, dab your skin with diluted rubbing alcohol or vinegar to help neutralize toxins left behind. Immediately removing your suit and showering is a must, as is washing your suit in a diluted vinegar or alcohol mixture and rinsing well. Calamine lotion and an over-the-counter antiinflammatory medication can also be helpful to reduce swelling and pain from itchy skin conditions. If these remedies fail to relieve your symptoms or your condition worsens, talk with your doctor about other treatment options.